1- When to use UniversRadio ATC RadioDesk ? 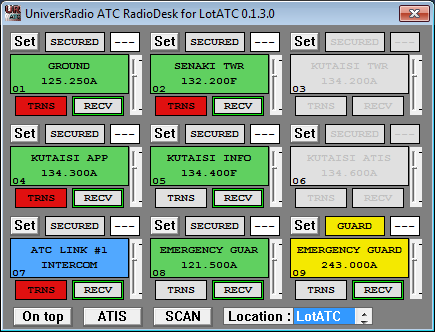 UniversRadio ATC RadioDesk is an external radio set for LotATC 4 DCS. This radio set can receive up to nine frequencies and can transmit up to three frequencies and with an intercom with an other ATC placed on the same tower. So 9 in, 4 out. First, LotATC 4 DCS must be launch and UniversRadio tab must be enabled with a selected location. Note, DCS is not needed. After, you will find UniversRadio ATC RadioDesk for LotATC shortcut in the Windows start menu => UniversRadio \ UniversRadio ATC RadioDesk. 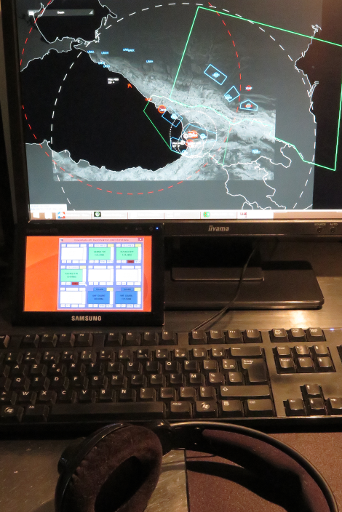 Eight first radios are free, and can be configured. Best experience : under 30.000 MHz relief does not cut communication and it has not range limitation. UR ATIS server can be launch form “ATIS” button. 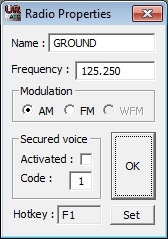 Configure the frequency and the METAR message. When a radio change frequency to ATIS frequency, an ATIS vocal message will be broadcasted. This module can be launched from “SCAN” button and it displays level signals of the wave band from 1MHz to 400MHz according to the window of scan. UR Scanner works only if you use LotATC and your location is an AWACS. Zoom and scanning range can be customized by mouse buttons. With this module, you can monitor radio transmissions of your coalition…And ennemies too…So be quiet and use cypher communication. 5- HELP. Which actions can be done ? And, how to do ? Only one channel can be encrypted. (4) Listening to a radio Double-click on "Text window". When you receive a communication. Left click on RECV light. RECV surrounded in green is waking (4). and QDM is displayed on top-right corner (6). 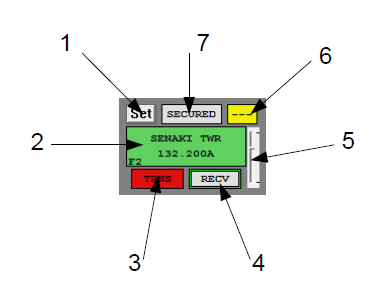 (3) Talking Click on "TRNS" light. Click and hold on "Text window" for PTT. You can talk to this channel when TRNS is displayed in red color. 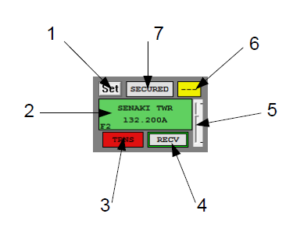 Only three radios can be setted as transmitter at the same time.